You're holding 2 oz of EcoPowered AirZyme Concentrate. Eco Discoveries is the only safe and effective solution for indoor air quality. Airzyme tackles odor molecules both in the air and on surfaces with natural enzymes. 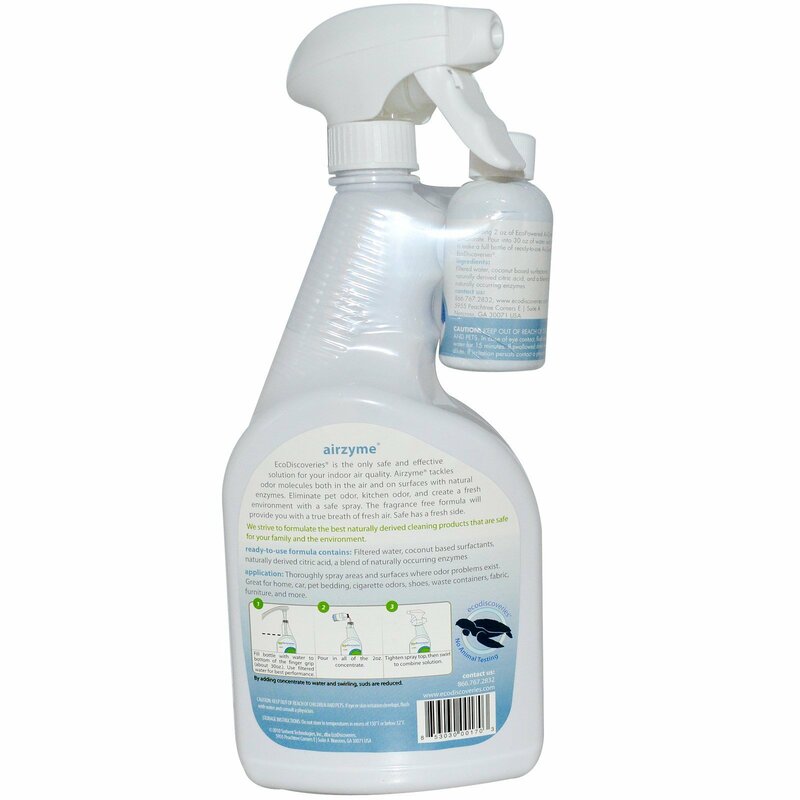 Eliminate pet odor, kitchen odor, and create a fresh environment with a safe spray. 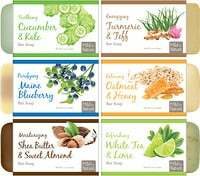 The fragrance free formula will provide you with a true breath of fresh air. Safe has a fresh side. We strive to formulate the best naturally derived cleaning products that are safe for your family and the environment. 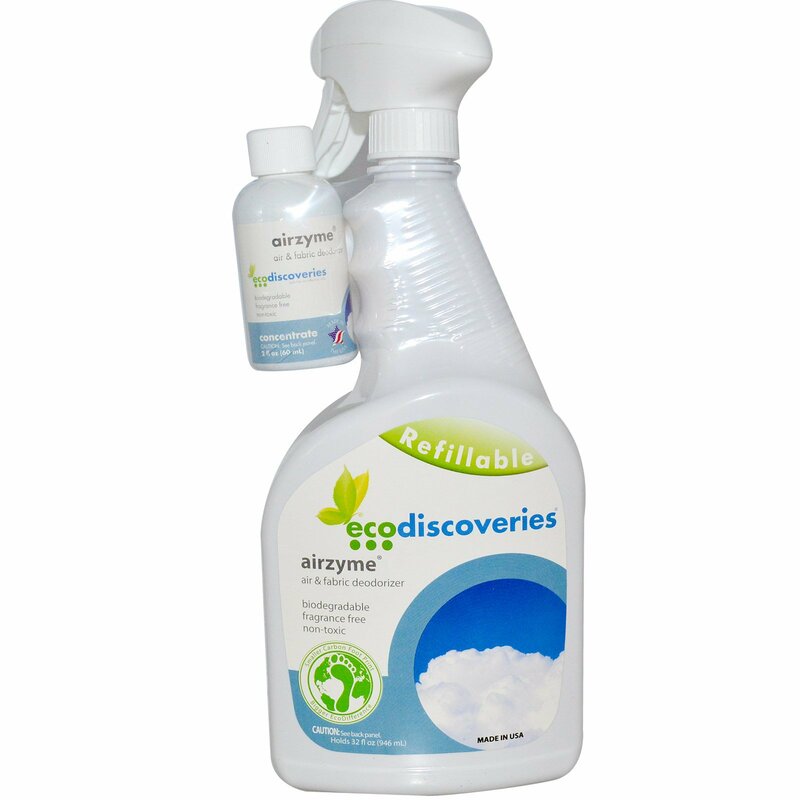 Pour into 30 oz of water and swirl to make a full bottle of ready-to-use AirZyme by Eco Discoveries. Application: Thoroughly spray areas and surfaces where odor problems exist. Great for home, car, pet bedding, cigarette odors, shoes, waste containers, fabric, furniture, and more. Fill bottle with water to bottom of the finger grip (about 30 oz). Use filtered water for best performance. Pour in all of the 2 oz concentrate. Tighten spray top, then swirl to combine solution. By adding concentrate to water and swirling, suds are reduced. Caution: Keep out of reach of children and pets. If eye or skin irritation develops, flush with water and consult a physician. Storage Instructions: Do not use in temperatures above 130°F or below 32°F. In case of eye contact flush with water for 15 minutes. If swallowed drink water to dilute. If irritation persists contact a physician. Ready-to-use formula contains: Filtered water, coconut based surfactants, naturally derived citric acid, a blend of naturally occurring enzymes.